REACH PH is an organization based in Cebu which help families living with Autism in providing a broad range of services which addresses the needs of these kids and other related disorders. The organization provides skills training program and functional education for children with Autism and families. Happy Little Hands have been granting wishes of numerous children and even elderlies in the Philippines. A friend from Cebu requested for Happy Little Hands to help REACH PH in finding sponsors because they are in need of slippers and toys which fits the need of kids with Autism. Six months of preparation and through the kind hearts of Manila friends and in partnership with U! Happy Events, more than 40 pairs of slippers were collected as well as educational materials and toys. Happy Little Hands team travelled to Cebu via plane carrying 2 big boxes full of gifts. The volunteer event was held at the REACH PH annex in Mandaue City. The team were welcomed by REACH PH founder, Ms. Sandra Espina, parents and kids with Autism. They also toured the team around to show some of the facilities they have like pool for hydrotherapy exercises of these kids. A special program was held by the staff. The team were touched when the kids sang and even gave them thank you cards. The kids were happy upon seeing their new slippers and toys. 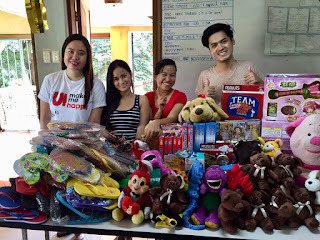 Each kid received each of those gifts and enjoyed their Jollibee treats. We also had a great conversation with Tita Sandra who is an advocate herself for kids with Autism. What a great way to spend your December!